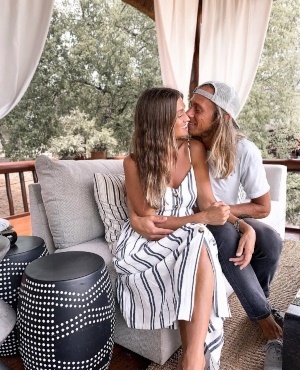 Recently, American couple Kelly Castille (33) and Kody Workman (32), who are from Michigan, shared a snap of themselves posing at a resort in Ubud, Bali, Daily Mail reports. In the picture, Kelly is dangling from the three-storey high edge of swimming pool kissing Kody, who’s in the pool and holding her weight. In the caption, the couple warns their followers not to replicate their picture. "Our greatest strength in life, our most important principle, is discernment," reads the caption. "Only you can know your body, feel the space around you and understand your capabilities. We would all do well to remember this, knowing that not every action, style or path we witness through others is or should be, replicated. Although the post garnered more than 22 000 likes on Instagram, the couple has faced severe backlash for putting their lives at risk. "Very stupid to risk the life of your significant one," one follower wrote. "Just for a stupid photo . . ."
"It amazes me that people cannot take responsibility for their own lives these days," said another follower. After spotting the thread of negative comments, the couple defended their actions. "We're both in good shape, we know our bodies and in turn, we know our limits," Kody said during an interview with Business Insider. "We had faith in each other and trust to pull this off and so we made the choice as a team to shoot it. "I held her the entire time and if zoomed, you can actually see my grip on her arm. "We've both jumped off of waterfalls and bridges much higher than this infinity pool so the height aspect wasn't a concern for us at all." Kelly and Kody reportedly met a one-and-a-half years ago and have been exploring tropical destinations since.